Undoubtedly, key parameters in reinforcing the role of the teacher are guidance and his empowerment at the early stages of his training as a teacher. 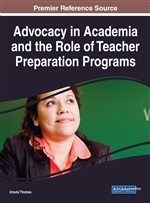 This chapter discusses the interconnection of advocacy with teacher mentoring programs, so that teachers may develop the relevant advocacy skills in order to act as defenders of equality and social justice. Moreover, specific aspects which are developed are the investigation of the concept of advocacy and social justice, the need for teachers to develop advocacy skills, the role of the mentor and the presentation of basic counseling models. Also, participatory advocacy practices, recruitment of mentors and the conception of a development plan of a wider program of advocacy, as well as advocacy models and the involvement of pupils themselves in all human rights advocacy processes are presented. Finally, the necessity for individual University Departments of Teacher Training to integrate the subject of advocacy in their curricula and provide prospective teachers with practice in this field are highlighted. Mentoring has been researched, mainly regarding the positive effects that such interventions bring about in relation to the performance of students. According to data recorded, it appears that, although some existing mentoring relationships have a markedly positive effect on the lives of children and adults, others do not have the slightest one or – even worse – they seem to have a negative effect (Dubois, Holloway, Valentine & Cooper, 2002). It is for this reason that the factors which contribute to a successful mentoring relationship ought to be further researched in areas such as professional conduct, organizational skills, and the contribution of leaders who initiate specific interventions in mentoring relationships. All in all, it is the dynamics that particular acting agents bear in the development of a mentoring program that should be further investigated (Louka, Giannikopoulos & Kougioumtzis, 2016, p. 66; Levine & Cureton, 1998; Solomon & Solomon, 1993). This text examines the shaping of professional identity, in correlation with the mentoring process which is understood as a necessary element of empowerment (Ponce, Williams & Allen, 2005), through a wide range of roles and functions, such as teaching, the existence of networks, counseling, encouragement, support and advocacy (Kram, 1985). In particular, this is an attempt to highlight the connection between advocacy and a mentoring relationship through which the teacher learns to act as an advocate for social justice. The process of training involves a wide range of collaborative practices depending on both the choice of mentoring model and the mentor’s advocacy skills and ability to communicate them to the mentored. There is, therefore, a practical connection in their implementation in the school community through broader development guidance models which interconnect school, academic and political leadership, and highlight the active involvement of students in the process of defending the right to equality and social justice.